Whether you want something better than the stock earbuds that came with your Ipod or just want a pair of decent portable headphones to bring around with you, there are plenty of excellent options out there for great quality headphones under 50 dollars. 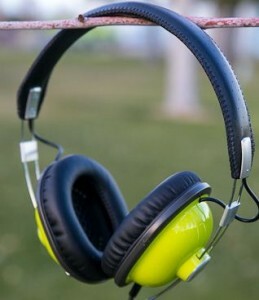 A pair of headphones priced below 50 dollars by no means that they’re “cheap headphones“, at least with the negative connotations that the word cheap can at times carry with it. The sound quality of some of the best headphones under 50 dollars can impress even the snobbiest audiophiles at times, myself included. However, despite the fact that there are some hidden gems in the under 50 dollars range, there’s also naturally more cheap garbage! Thankfully, we’re here to sift the treasure from the trash for you. Below you’ll find our picks for the absolute best headphones under 50 dollars which are currently available; if you think there’s something we missed, leave a comment below and we’ll take a look! This is a constantly growing resource. Panasonic might not be the first name headphones snobs go to when discussing high end audio equipment, but when it comes to the best headphones under 50 bucks, the Panasonic RP-HTX7 models might be exactly what you’re looking for. Equipped with what Panasonic refers to as ‘Retro Styling“, the Panasonic RP-HTX7 headphones are purposely built with an old school retro design that encompasses every aspect of the aesthetics. From the adjustable leather headband to the large, bulky looking ear cups, these have a great added bonus for those who are into a little retro flavor. You can even purchase them in a large variety of neon colors on the ear cups, including everything from lime green to fire engine red. If you’re trying to keep a low profile they’re also available in standard black though! While the Panasonic RP-HTX7′s may boast a retro design, they definitely come equipped with modern audio capabilities. For headphones under 50 dollars, you can’t expect pristine clarity, but the HTX7′sdefinitely pack enough of a punch to satisfy your average music lovers needs. The mid range frequencies are somewhat more pronounced that the highs or lows, which gives them a fairly balanced frequency spectrum. While they might not be “boomy” or jaw rattling enough for a dedicated bass head, its punchy and present without muddying the highs. The completely closed over the ear headphones design also does a pretty solid job of keeping external sound out while preventing almost all sound from leaking into the environment around you. Comfort is a non issue with the RP-HTX7′s, too. At a weight of only 5.4 ounces (not even half of a pound), you’d probably be surprised at how lightweight these are considering their size! You can probably tell with just a look at the giant retro ear cushions that they’re comfortable to wear too, even for hours at a time. 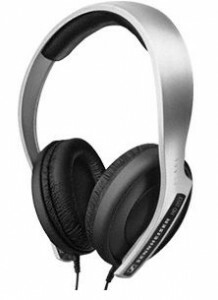 Sennheiser is a line of headphones synonymous for high quality, all the way from their entry models up to their professional headphones that cost as much as $1500. They seem to have some of the best headphones for any time, place, or purpose, and in the case of the Sennheiser HD 203′s, you’re getting professional, high quality sound without the price tag. 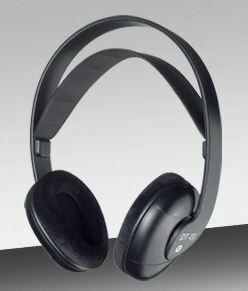 Sound quality is top of the line for the price range, as you can generally expect any Sennheiser headphones to be. The highs, mids, and lows are all extremely balanced, and while there definitely seems to be some slight emphasis on the bass, it doesn’t ever get in the way or muddy other frequency ranges whatsoever. While the Sennheiser HD 203 headphones certainly emphasize bass and low end slightly, all frequencies are extremely well balanced. You’ll hear a surprising amount of detail that you probably hadn’t before. The semi closed back design gives them a decent degree of sound isolation; while they’ll block out the majority of ambient noise around you, loud noise will penetrate. There is very little sound leakage however, so those around you won’t be subjected to your music unless you’re seriously cranking the volume. Comfort is another strong suit of the Sennheiser HD 203′s. Whereas most cheap headphones skimp here, Sennheiser provides a level of comfort on the HD 203′s that rivals many high priced competitors. The thick leather ear pads rest softly against your ears and can be worn for hours without any sort of fatigue, while the inside of the durable headband is affixed with more soft leather padding. They’re extremely lightweight too; at just 4.6 ounces, they’re barely a quarter of a pound! Wearing these for long sessions is really easy since they’re practically weightless compared to most full sized headphones. Even if you probably hadn’t considered traveling with the Sennheiser HD 203′s or subjecting them to many situations in which they could be damaged, these would probably be some of the best headphones under 50 bucks to do so with. Many users describe them as practically indestructible, and although I wouldn’t put that theory to the test, you can tell that these headphones can take a serious amount of abuse due to the quality construction that goes into all Sennheiser headphones! This is partially what makes them DJ headphones, as they tend to be subjected to a lot of damage. 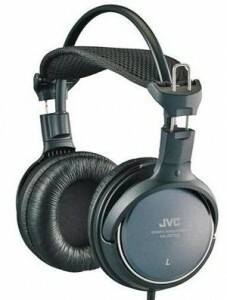 JVC is another company I normally wouldn’t have given much thought to as a designer and manufacturer of headphones. Over time I had heard a lot of great things about the JVC HA-RX700 headphones though which prompted me to finally give them a try, and to my pleasant surprise, I found them to be among the best headphones under 50 dollars, vastly outperforming many models that are still twice the price! The first thing most people notice is the size of these. The JVC HA-RX700′s are full sized over the ear headphones and as such you can expect them to be pretty large, but these are on a whole different level! While they’re excellent for at home use, you wouldn’t want to bring them out in public with you. The bulkiness and weight are just too much, especially with no way of packing them away. The HA-RX700′s are certainly durable, though – the bulk of the headphones are constructed from a tough, durable plastic which covers the vast majority of the exterior. Besides the fact that they’re a little heavier (at around 2 pounds), they are very comfortable to wear. Thefull sized ear pads are made from some sort of pleather material which is soft and comfortable enough to rest on your ears for hours without getting uncomfortable, although they can get a little warm over time. The headband is also adjustable and is equipped with a pressure dispersing mesh head pad. Sound aulity is also downright exceptional for a pair of headphones under 50 dollars. I’ve tested many models of headphones twice the price that don’t measure up to the full, warm sound range that the JVC HA-RX700′s offer. Bass, especially is a strong suit – outfitted with 50mm neodymium magnet sound drivers, these headphones create a wider, more textured sound stage/bass response than most headphones in this class are capable of by far! Beyerdynamics slightly more advanced version of their former DT 231′s, the Beyerdynamic DT 235′s are priced between 40 – 50 dollars or so. They aren’t flashy or boast bells and whistles of any kind, but they make some of the best headphones under 50 dollars with their excellent sound quality and no nonsense design. Sound quality on the Beyerdynamic DT 235′s is fairly impressive for headphones in their price range. The bass and low end is tight and punchy, while there’s a great deal of clarity to mids and highs as well. Overall, the DT 235′s have a very balanced frequency range, with neither the highs or lows getting in each others ways respectively. While most cheap headphones have problems reproducing bass at low octives and crisp highs, the DT 235′s have an impressive amount of range. Due to their “on ear” (or supra aural) design, they do offer a pretty decent amount of sound isolation. Ambient noise around you is blocked out fairly well, but you’ll still hear background chatter in a noisy room. In terms of comfort, the Beyerdynamic DT 235s might be your best bet in this price tier! Manyheadphones under 50 or so have clunky or ridged construction which makes them unbearable to wear for long periods of time, but thankfully the DT 235′s don’t face this common problem. The velour on ear pads rest softly and comfortably on the ears, and with the adjustable headband you can get a perfect fit. The ear cups swivel too, which makes them even more easier to fit precisely how you want them. Besides all of that, weighing in at just around 6 ounces makes them lightweight enough to practically forget that their on your head! The little brother of Audio Technica’s ATH-M50 headphones, the ATH-M30′s are very similar in many ways, including down to the way they look. Aesthetically, these headphones are pretty straightforward – all black, no frills, but that’s how I like my headphones. Although most places don’t sell these for under 50, their price hovers right around that, so I felt they belonged on this list! 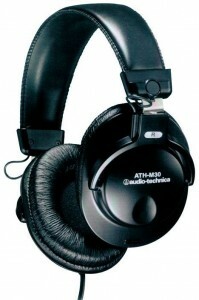 The Audio Technica ATH-M30′s are similar to the M50′s in most of their design. They’re full sized, closed back over the ear headphones which completely cover the ears, creating a seal which most external noise won’t penetrate. Unless you’re cranking the volume, sound leakage is practically non existent. This probably won’t be an issue for most users though, since the ATH-M30′s aren’t exactly the most portable headphones – although they’re pretty lightweight for full sized headphones (just around 1 pound), they don’t fold up or compact into a smaller size for transport. Being so lightweight does help tremendously when it comes to comfort however, an area where the Audio Technica ATH-M30′s excel. The ear cups themselves are covered in soft pleather ear cushions that you’ll have to problem wearing for many hours, while the tough headband is completely padded. Literally anywhere that these headphones make contact with your skin is padded, so they’re exceptionally comfortable compared to many cheap headphones. Sound quality is top notch, just as we’d expect with any Audio Technica headphones products. The closed over ear design creates a nice full sound stage without getting muddy or too boomy. Bass and low frequency ranges especially are lighty ears ahead of most headphones under 50 dollars due to Audio Technica’s 40mm neodymium sound drivers, which provide a warm and textured frequency range like none other.